Tokyo Mise is located on the ground floor of Corredo Muromachi 3 in the very upscale district Nihonbashi. 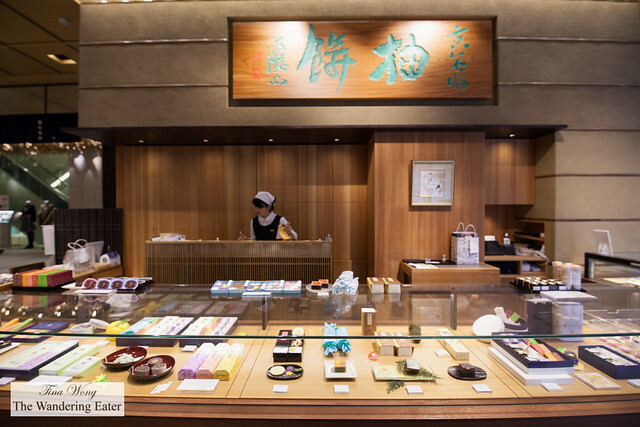 It is both a sit-down tea salon and a retail space where one can pick up a couple of sweets to go. 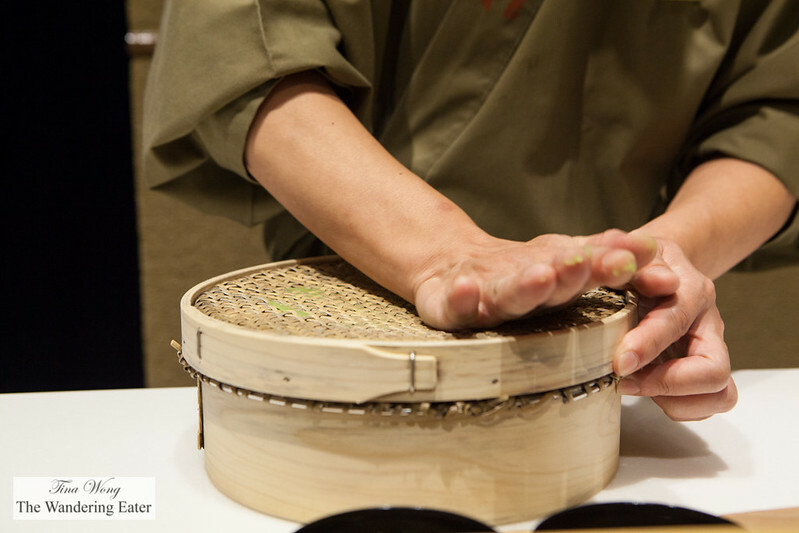 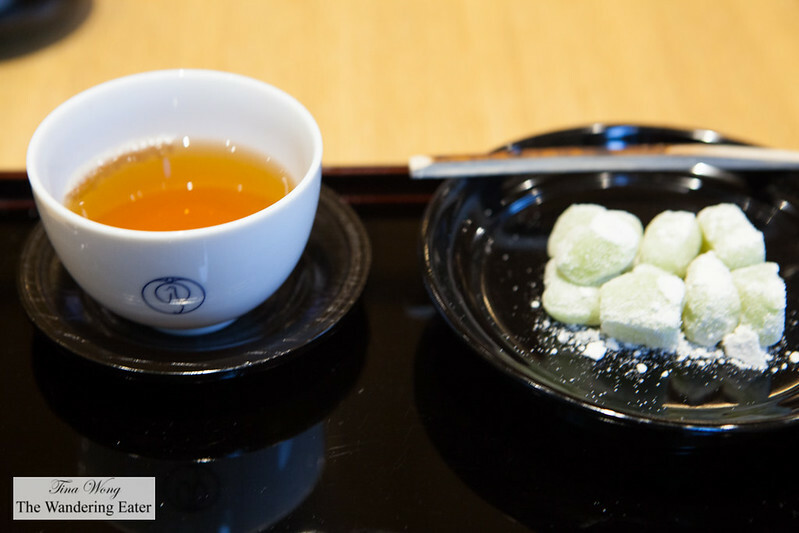 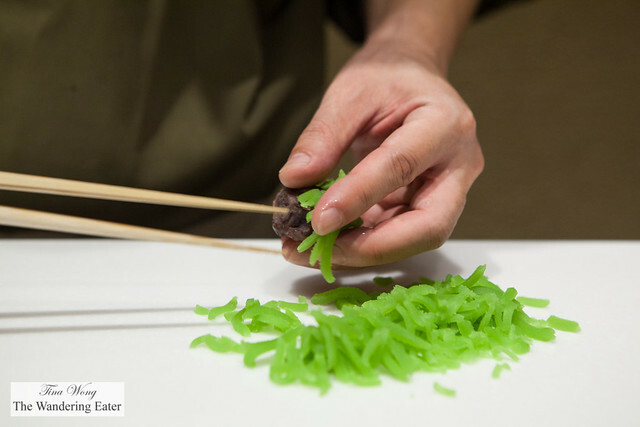 Tokyo Mise is founded in 1803, headquartered in the Nishijin district of Kyoto and serving wagashi (traditional Japanese sweets) that reflect the four seasons and based around the Japanese tea culture, including matcha green tea. 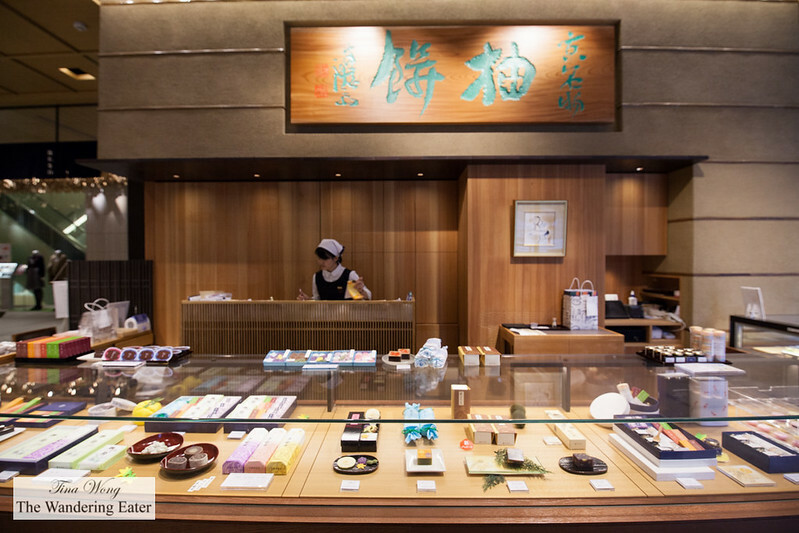 Tsuruya Yoshinobu (Tokyo Mise’s parent company) expanded to Tokyo’s Nihonbashi area for clients to savor freshly made treats made in front of their eyes by top confectioners. 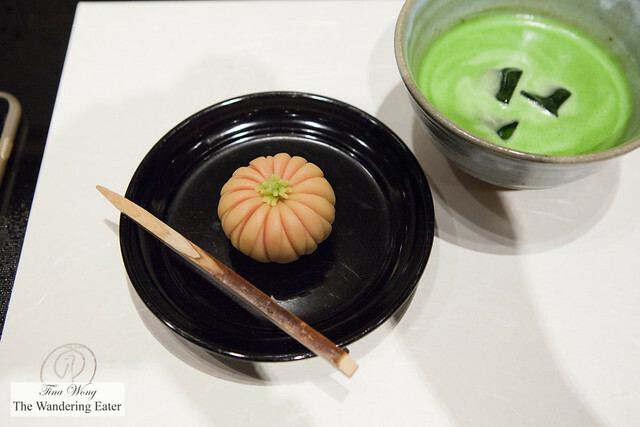 We have opted for sitting at the counter seat to see the head confectioner/chef to make the namagashi or freshly-made wagashi. 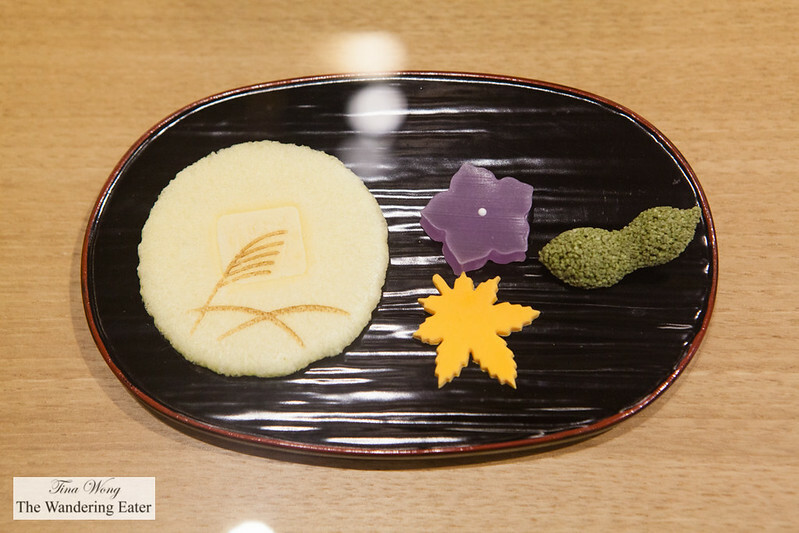 My friend was intrigued by the Akikusa (golden lace) that looked like a small rock covered in moss and lichen. 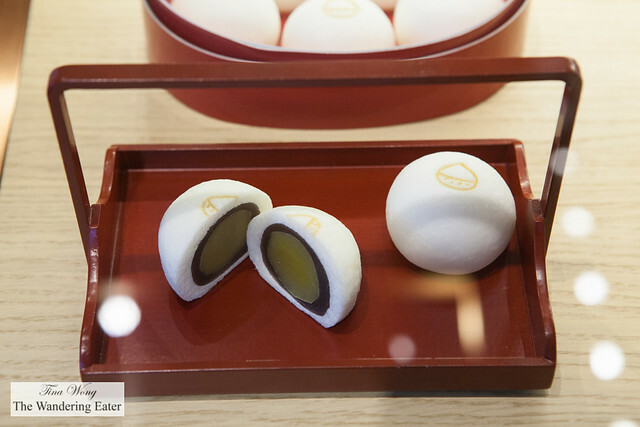 What this wagashi is made of is a core of ogura-an that has a combination of red bean paste and whole red beans, covered in a multicolored, strained sweetened white bean paste. 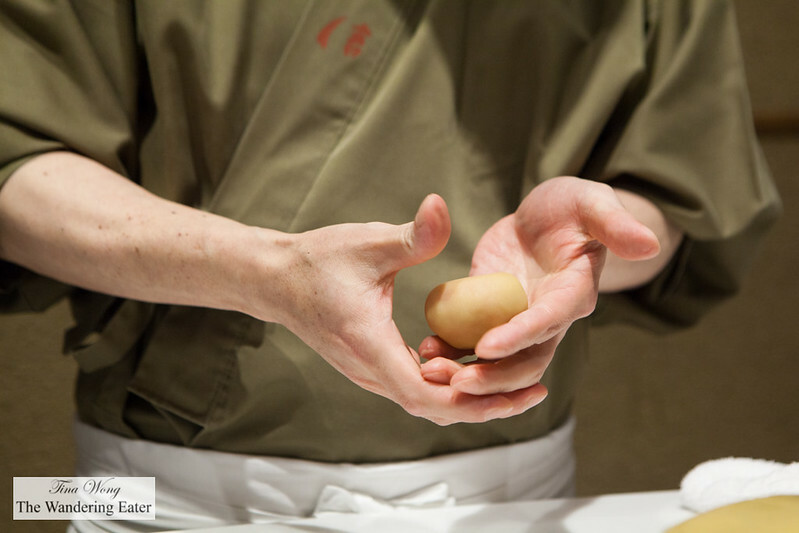 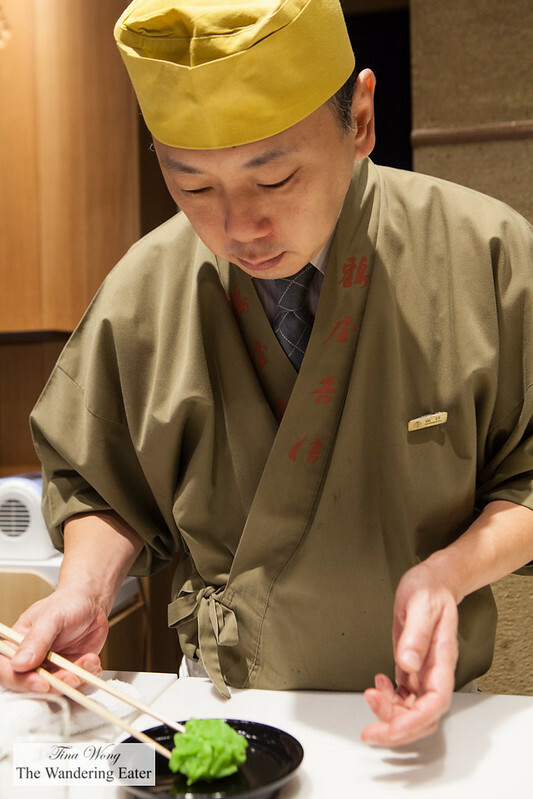 It’s mesmerizing to see the chef to create this before your eyes. I opted for the kikunoga or chrysanthemum shaped namagashi. This is a simpler, if you will, wagashi as it’s made of a solid ball of colored, sweetened and smooth white bean paste, rolled to shape and topped with a small leaf top, also made of white bean paste. 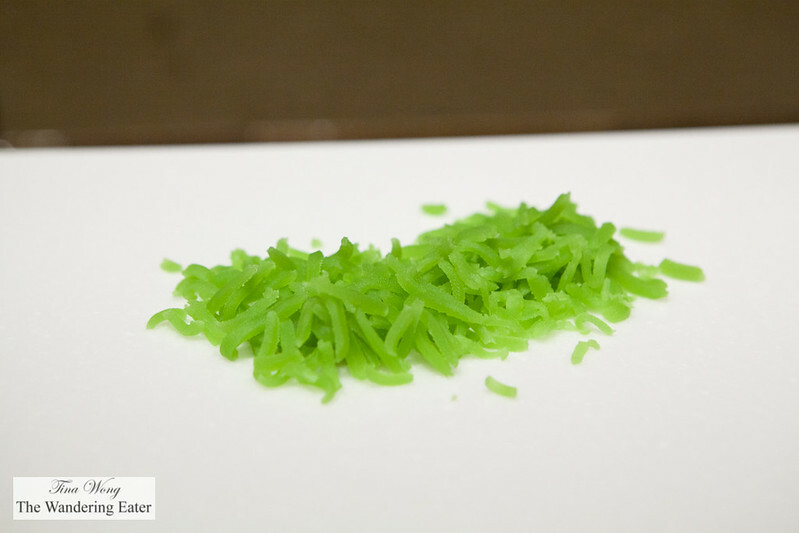 Though the process is generally easier, I know if I try to make this at home, I’d be struggling for a good 30 minutes to get the impressions right. 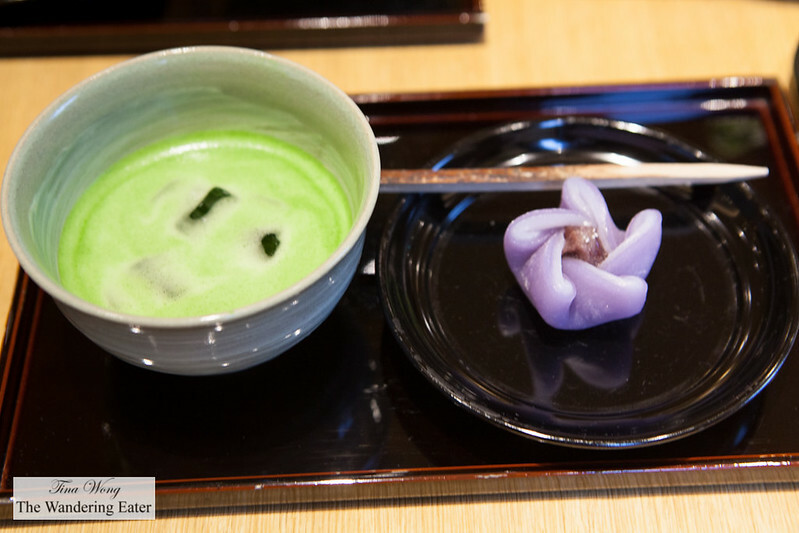 We opted for iced matcha green tea to pair with our namagashi since it was humid and warm out in Tokyo. 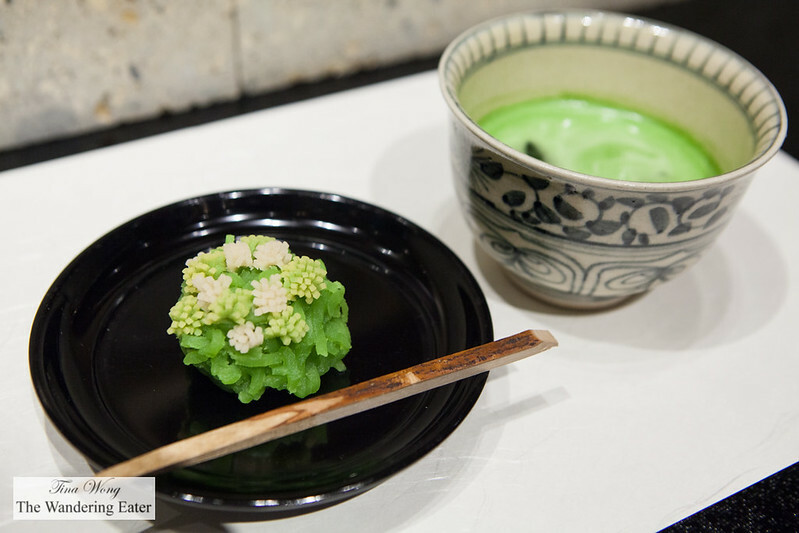 Both sweets paired wonderfully with the bright, grassy matcha tea. 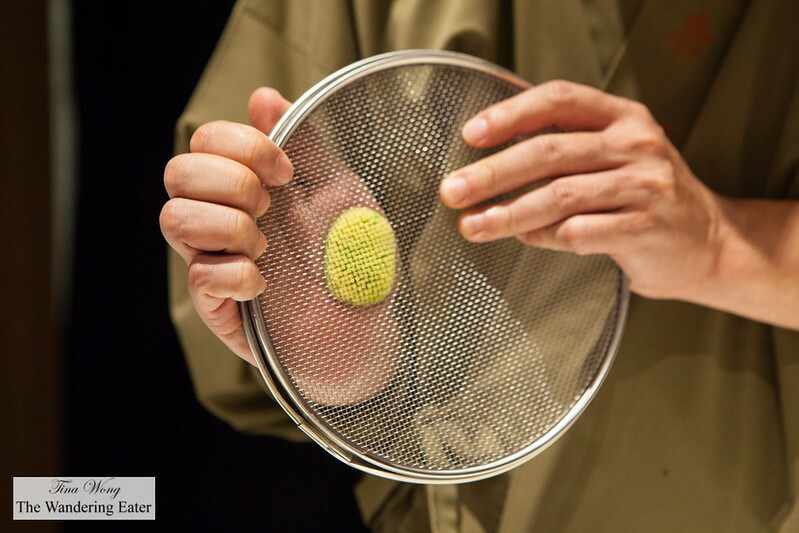 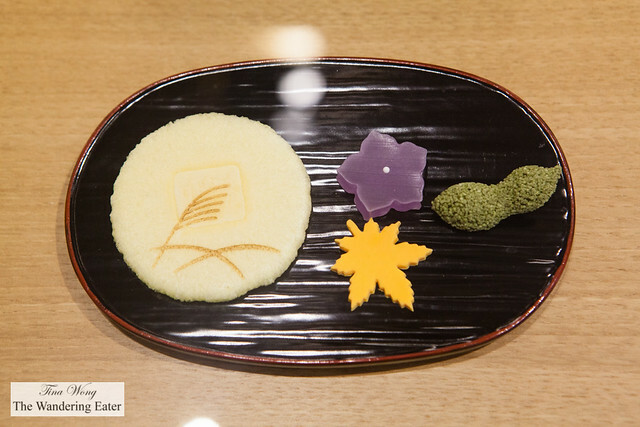 We loved both namagashi since they were not sweet but the “golden lace” wagashi was slightly more interesting to have since the two different bean pastes’ textures and flavors. 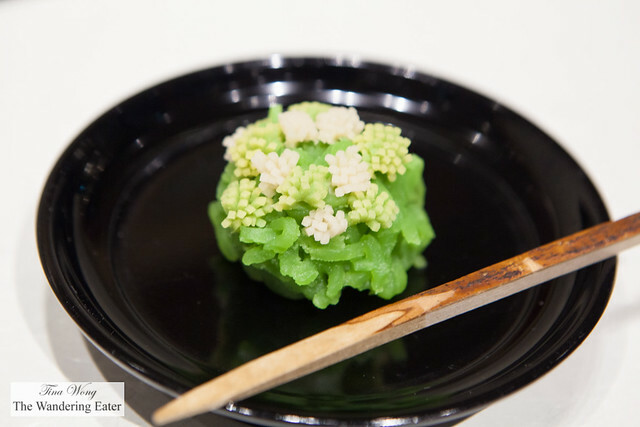 My other friend had the kikyou (Chinese bell flower) made of ogura-an that has a combination of red bean paste and whole red beans, covered in a soft rice cake shaped like a flower. 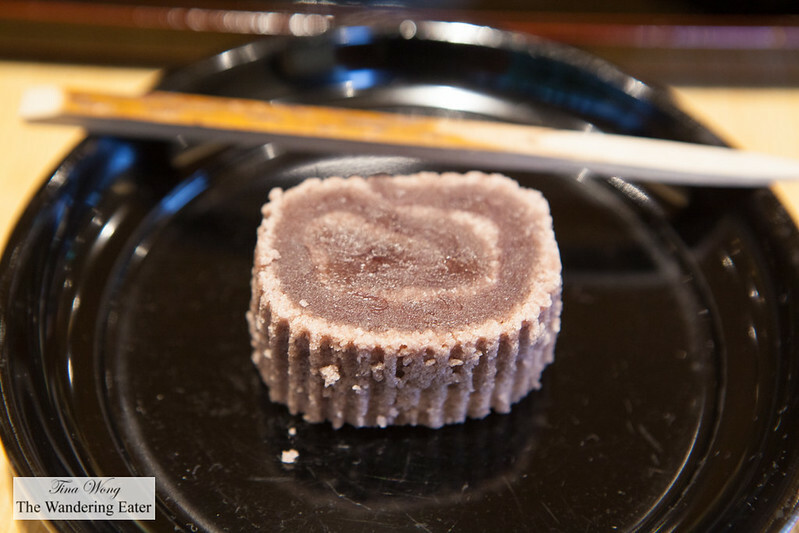 This was still a tasty treat since it’s subtly sweet and the slightly chewy rice cake exterior provided some texture besides smooth bean paste. We saw an older woman taking a shopping break, who sat near our table and ordered a bowl of the matcha kakigori (かき氷) (also called in Japanese, ujikintoki) while we were having our namagashi. The moment when her order arrived and seen the tall, beautiful pile of shaved, forest green matcha tea ice, we ordered one. 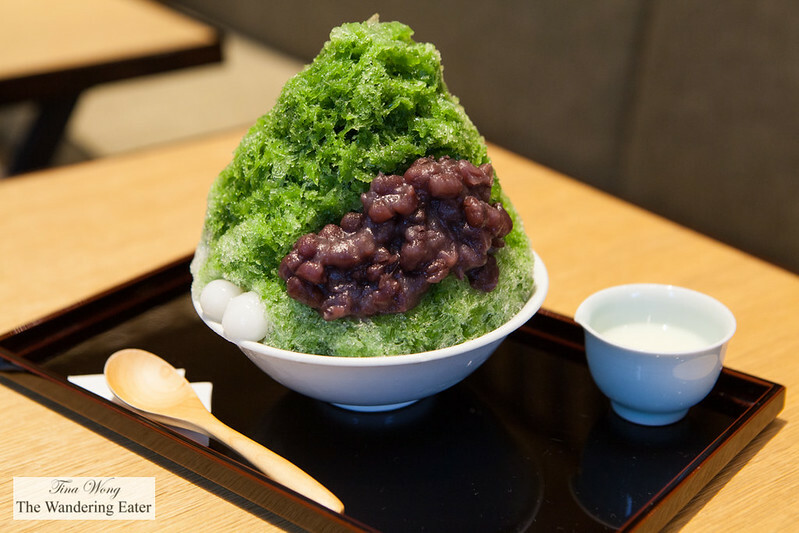 When our bowl of ujikintoki arrived, we were beaming like children who is presented with a huge ice cream sundae, except this is a grown up version that has less sugar and cream. 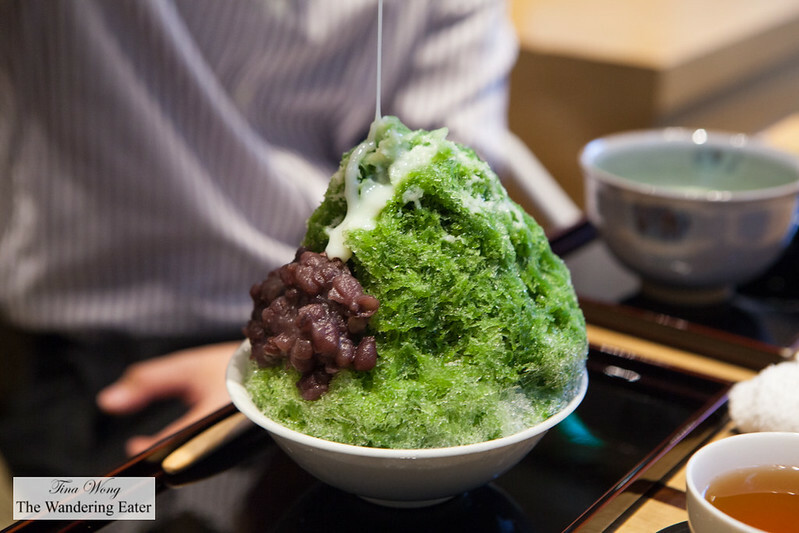 The matcha used in this shaved ice was a little bit of bitter and sweetness. 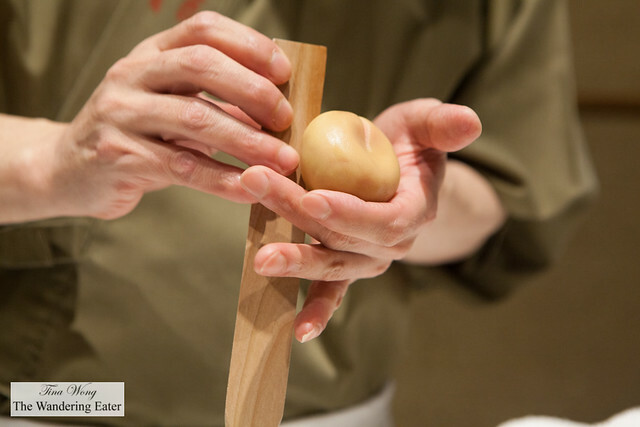 There was a small section of ogura (sweetened cooked red beans) and shiratama (small balls of mochi or glutinous rice cakes). 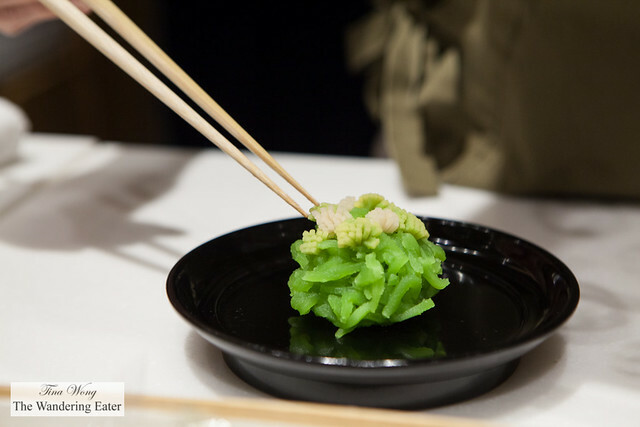 It’s sublime. 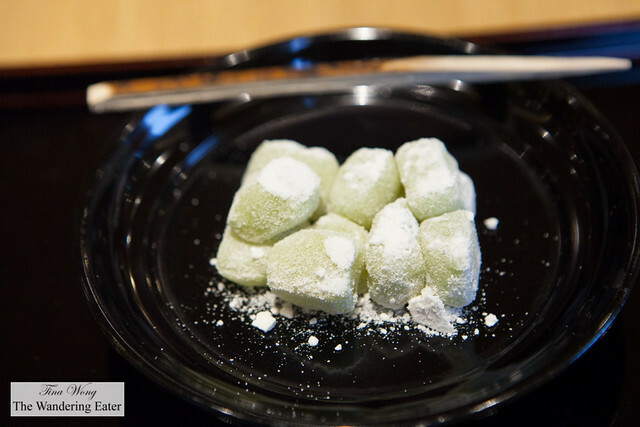 Not too sweet, delicious and definitely cooled us down. 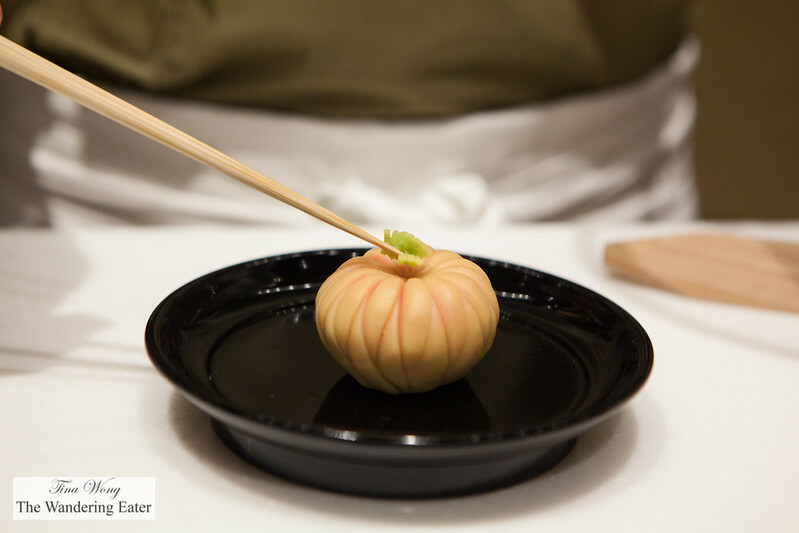 Do note, this ujikintoki is a seasonal dish for this shop and will take this off the menu by the end of September. The other one is called “Kyoto Kanze.” It’s one of their oldest recipes (created in 1920) using various textures of red bean and white bean pastes. 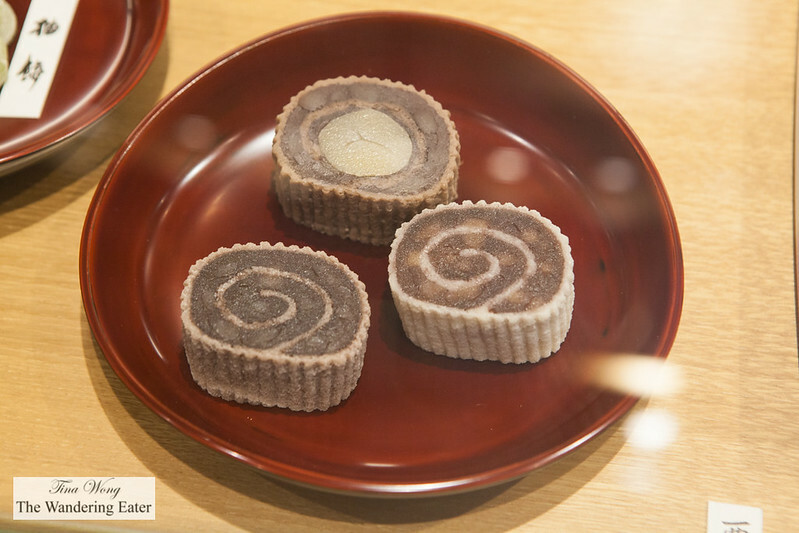 It looks like a Swiss roll cake but it’s entirely made of bean paste. 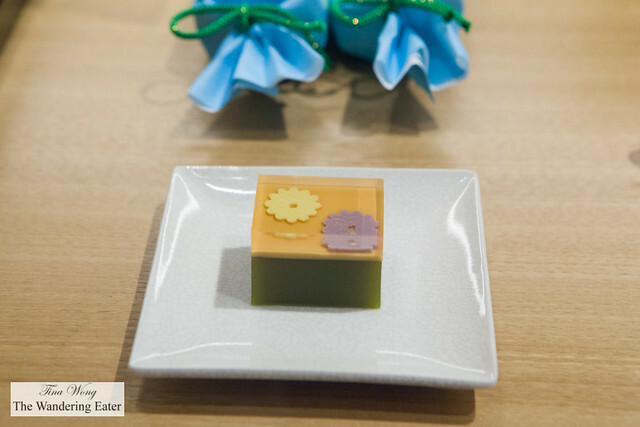 Majority of this particular slice is made of coarse sweetened red bean paste then layered with a thin amount of white (and a smidge of red) bean pastes. It’s rolled up with a certain mat to give the outside the rugged texture. 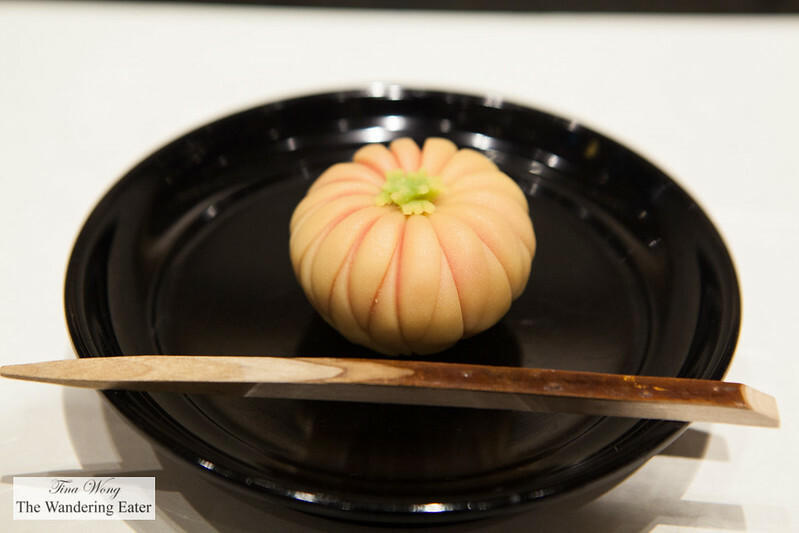 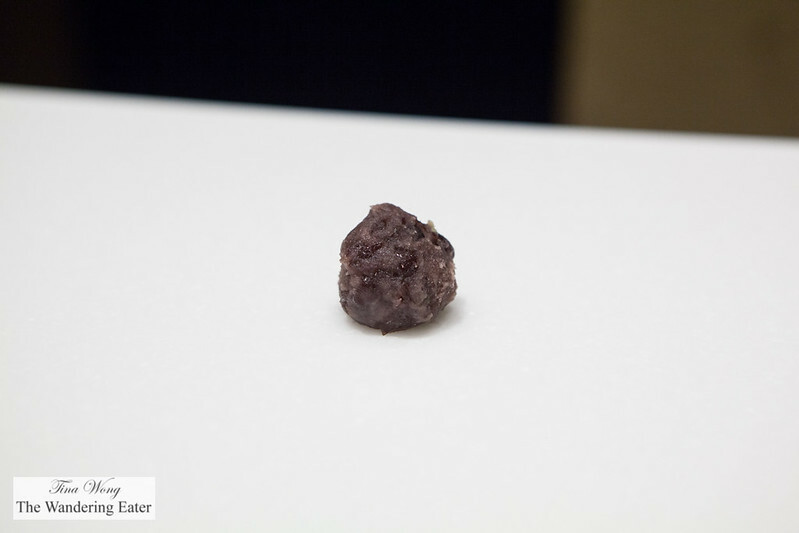 It’s a great wagashi that is a study on the textures and flavors of bean pastes and it’s not that sweet. 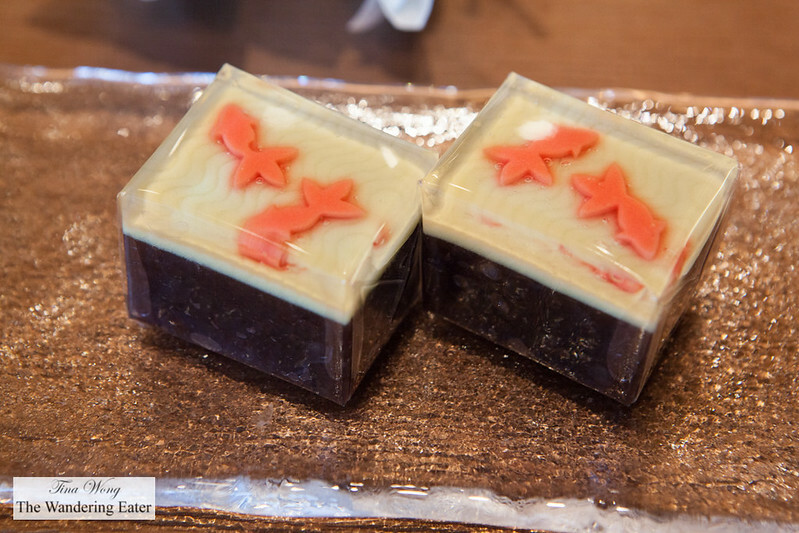 If you’re ever in the mood for excellent traditional Japanese desserts, I’d heartily recommend Tokyo Mise. 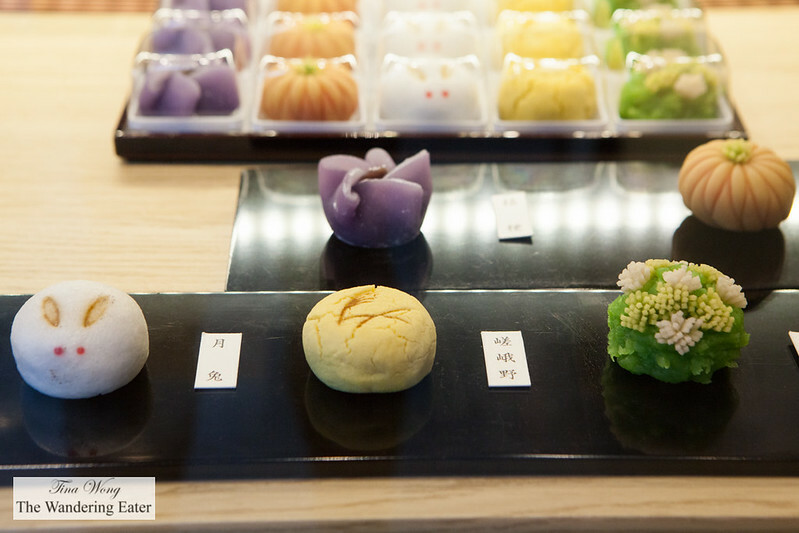 The wagashi are beautiful and absolutely delectable. Nothing is too sweet. 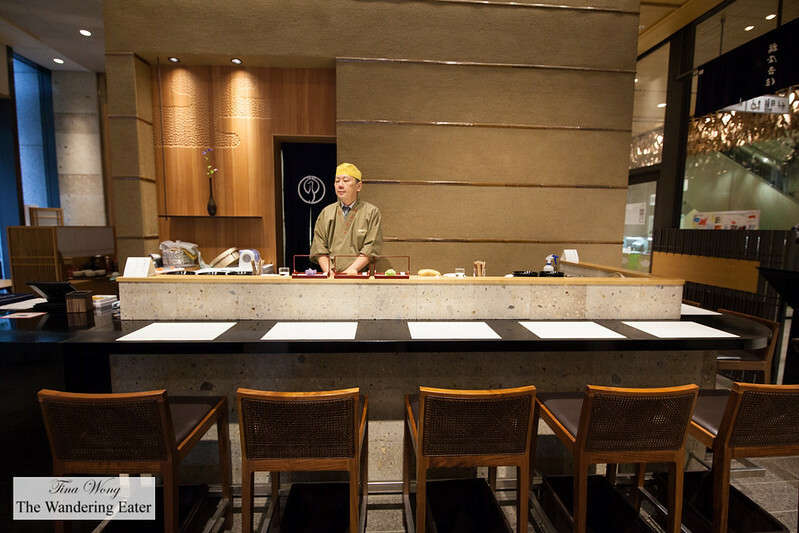 The staff is very professional and friendly (even to a non-Japanese speaker like myself) and you’re dining in a serene atmosphere with a view of the busy streets of Nihonbashi.